Captain Kado Oquońe is very different from a Rebel Fleet Trooper. The base of his costume is Private Weems' costume. Then he wears a Draven style jacket with an Army Captain rank badge, similar to Captain Cassian Andor. Due to the different rank, his jacket has green piping on the chest pockets instead of red piping. 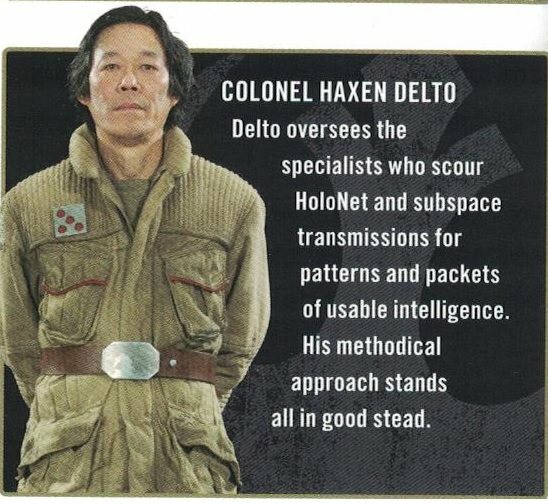 He wears his PLCE belt on top of the jacket, the same way, Colonel Delto wears his RFT belt on top. The costume is then completed with an RFT helmet. Unfortunately, there only a few reference photos of Captain Kado Oquońe and they are probably not enough to get him approved at the moment. We might consider making a CS for his style of costume because we pretty much know how it looks like because of the reference photos of all the mentioned characters. I did a lot of research for these costumes and can help you with the reference photos. Excellent thank you so much. I am not sure how to attach photos, I'm new to this board) but you nailed it. Thank you. The shirt is the same as a feet trooper but in Kaki? The belt will be the biggest challenge for me. The jacket is based on a common coat somewhere? Any pointers on which one? Yes piping and pocket changes as well as the quilting for the shoulder yoke and elbow pads. I have a completed Fleet Trooper. I need to submit for approval. Really need to do that so I can be a full member. SO I see cargo pants. Would that be acceptable for Kado? You will need a host like Imgur to post your photos in your thread. First, you upload your photos to the host then you copy and paste the link that they provide into your post. Yes, the shirt is basically an RFT shirt in the color tan or khaki. The belt is a British PLCE belt with a roll pin buckle that is worn inside out. It sometimes can be bought on eBay and/or British online shops that sell military items but the desert/sand colored version is getting rare. The easiest way to get it is to buy a tan/desert PLCE belt with the black plastic snap buckle and buy a spare roll pin belt buckle. Then take the belt apart and add the new buckle. That is the way I have done it for my Signals Intelligence Technician. 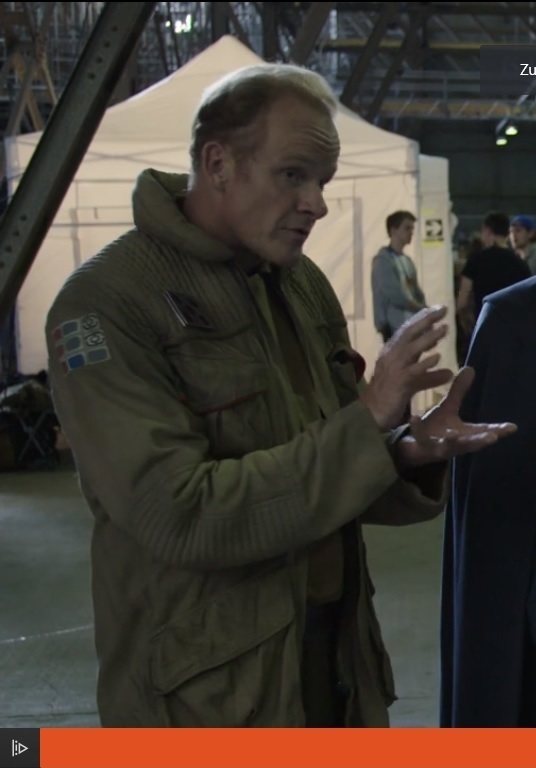 As far as I can tell, the jacket was created specifically for the film Rogue One but has some similarities with Rebel officer jacket in ESB. You will have to sew the jacket yourself or commission it with tailor/seamstress. Yes, dark brown cargo pants would be approvable if there was a Costume Standard for this costume. If you want to get it approved without an existing Costume Standard you have to make an exact copy of the costume and get it approved as a face character under The Article II: Costuming Standards of the Legions Charter. Unfortunately, that would be very difficult because there are not enough reference photos of Captain Kado Oquońe. I would help you if you want to try to create a Costume Standard. I am very familiar with the rebel costumes of Rogue One because I proposed the Costume Standard and made the first costume of the Signals Intelligence Technician, which is basically a generic version of Private Weems’s costume. I also helped create the Yavin Operations Officer and the Yavin Operations Trooper Costume Standards. Last but not least, I proposed the Costume Standard for the Senior Officers, Rouge One and am currently making that costume. I have to warn you creating a Costume Standard is a long process and often difficult. We have been working on the Senior Officers, Rouge One Costume Standard for seven months and it is still not finished. If I were you, I would start with a Signals Intelligence Technician and then add the parts that you will need for Captain Kado Oquońe. I will look at my Rogue One references and check if I can post some good screen caps of General Draven's jacket tomorrow. Fantastic. I love it. Thank you for your help. It would be great to get a Costume Standard. I may have a buckle that I ordered a few years ago while working on my SpecOps costume. I wonder if this is a good base for the coat? It may be too long. This one has the loops I think you mentioned. Here are all the references for Captain Kado Oquońe that I could find. I will look for General Draven and Colonel Delto tomorrow. The last belt is the one that you will need for your costume. The loops on the inside that are worn on the out side in Rogue One, TFA and TLJ are the important part of the belt. It is very difficult to replicate them. You also have to be careful when buying a used one because soldiers often write their name on the inside of the belt with a permanentmarker. It can be very difficult to get the markings of because it gets into the fibers of the belt. Could you please edit your first post and add or change your subject so that it is visible in the forum? Here are some references photos of Draven's jacket. Here are some more screencaps of Draven. I found them in the ROGUE REPORTS: SUPPORTING CAST video clip on Starwars.com. [quote="PArmstr"]Could you please edit your first post and add or change your subject so that it is visible in the forum? I tried to do that but it does not seem to take the change.